International simposium. Memory as Clout. This symposium takes on the topic of memory as an instrument of power. 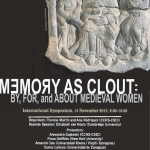 Women’s roles in memoria and commemoration have been well studied by scholars of the Middle Ages; indeed, they are a central theme in the historiography of medieval woman. To date, however, memory has almost always been framed in terms of religion and piety. Here, the papers presented tease out the various functions of remembrance, adding a new layer to traditional concerns with family and spirituality. They analyze the multiple ways in which memory in the Middle Ages could be wielded to enhance a woman’s power. 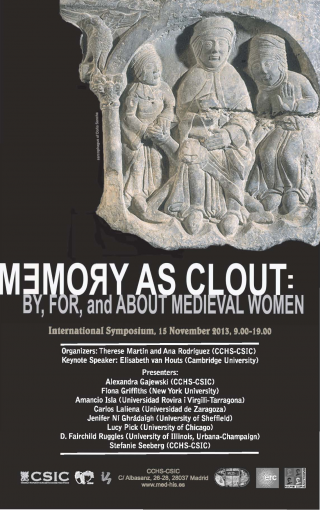 Employing evidence draw from both written and visual sources, the participants in this symposium open new perspectives on the significance of memory, recognizing its multiple contributions to medieval women’s clout. Organized by: Therese Martin (IH, CCHS-CSIC) and Ana Rodríguez (IH,CCHS-CSIC). Sponsored by Reassessing the Roles of Women as ‘Makers’ of Medieval Art and Architecture (ERC Starting Grant no. 263036), Power and Institutions in Medieval Islam and Christendom (PIMIC, Marie Curie-ITN no. 316732), Instituto de Historia (CCHS-CSIC) and MEDhis (CCHS-CSIC).